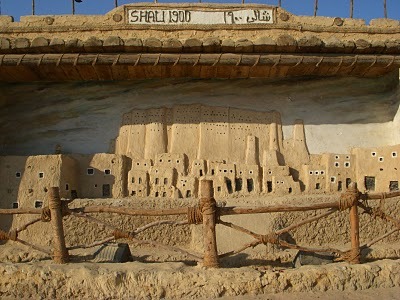 This is a picture of what the Fortress of the Shali looked like. Here is the ruins of the Shali, heavy rains damaged it in 1923. It really never rains here, although, when it does; the rain can cause major damage to the mud brick buildings. 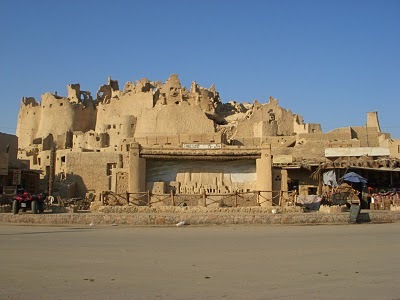 Siwa would not be the same without the mud houses. So I have some set plans for now. The Canadian girl I met expressed the most difficult thing is to decided how long to stay and when to go. I have found this subject to be a difficult thing also. Although, I have been a very decisive person which helps. I am going to stay at the Palm tree’s hotel through Friday night. Saturday I am moving to the house and bring a bunch of food to do some home cooking. Eggs and fried potatoes are first on the list. After the week I will go back to the palms hotel and stay through Monday. The guy at the hotel is super cool, we have been hanging out in the evenings. He has invited me for dinner twice, I walk with him to the bus stop in the evening to hand out cards to the tourists. The bus stop is quite a comical picture. All the taxi boys bombard the tourists, but leave the Egyptians alone because they don’t pay well. It’s quite funny to watch. The guy from the hotel is looking for a good deal with a 4×4 to drive me to Bahariyya, possibly for under 500LE which is a good deal. I have also came across another route which could work out. Go south first, then slowly head north to Cairo, From Cairo take a bus to Dahab through Suez and Port Tawfig into the Sinai Peninsula. The guy from the hotel has been sharing all the cultural aspects of Siwa. It’s all very interesting. I guess they keep all the female donkeys 35KM away from town with Bedouins. It causes a stir if a female donkey is within the town. It can ease the women of Siwa, just think they would be sitting at home always wondering if the husband is boinking the female donkey out in the Palm grove. Kind of crazy if you ask me, I guess I don’t see what the attraction is. I ran into the woman from Chicago yesterday, her and her husband are very nice people, we are going to have breakfast tomorrow. Today I am going to rent a bike and go out to the Fatnas spring for a dip and bike to the edge of the desert. My digestion seems back to normal for the most part, eating yogurt has helped a lot. I am having my interest come in from my bank, it is kind of nice. I will be able to pull out over 1500LE, what a deal. That could last three weeks or more. The ATM’s that I have used have worked, although I do have a four digit pin and I have heard that a six digit pin doesn’t always work. Here is a picture of the Temple of the Oracle, this is where Alexander the Great visited for the famous oracle telling him he was the “son of god”. Little did he know there was a woman in a secret compartment behind the wall of the inner Temple. Although Alexander the Great did have divine direction within his life from what he accomplished. 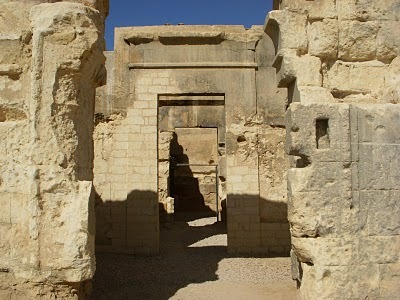 The Temple of the Oracle and the Amon Temple and the Cleopatra spring was all connected back at that time. So I am seeing a deeper level of the culture here in Siwa. If you ask are the men chauvinistic pigs, the answer would be a yes, although you have to consider the culture without judgment. A person does not see any women except for the tourists. Mostly men on the streets including male donkeys, lol, that’s the funny part. For a man to get married he has to pay the father of the daughter 10,000 pounds, which is a lot out here, plus be set up to take care of the family that he would be having. The taxi boys I was talking with like women from the west. These kids are very curious about the west and sexuality. When you look on the other side of the culture the people out here are very honest and kind. They also seem OK with who they are in life. They know that life could be better, but they don’t seem jealous or envious at all. A far cry from the western mentality. Everyone talks to me about buying a house which would only cost $10.000, plus I could buy land with a palm garden for $20,000. The palm garden is a moneymaker from olives and dates. It is something I just have to pass up, although the locals talk to me about this all the time. In the long run Siwa would be a challenge to live, a man would have to be married – bottom line. Previous post: Great News, more culture.